The population of cities in the developing world is expected to double in a generation, presenting a host of challenges to urban planners and policymakers. Taking into consideration the housing needs of the poor, as this story describes, is a key consideration. 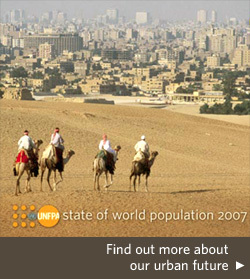 Read more about the challenges and promise of our urban future in the State of World Population 2007 (releasing 27 June). CAIRO , Egypt — Feryal El Sayed has called a tiny square room and a tinier cubicle containing a kitchen and a bathroom ‘home’ for the past 15 years. The main room is barely large enough for a bed and two seats. Photos of her late husband, her three sons and their children frame a mirror hanging on one of the flimsy blue walls, alongside a medicine cabinet and a photo of a sunset – plucked from an old calendar of indeterminate vintage. The makeshift roof is falling part, and a plastic sheeting under the ceiling catches the debris. However, Ms. El Sayed, 62, is still better off than other residents of Ezbet El Haggana’s District 3, who have no roofs over their heads, and who, on rainy nights, are forced to sleep under their beds. 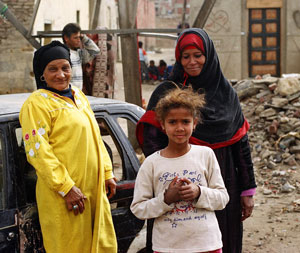 Ezbet El Haggana, a sprawling slum in the north east of Cairo, is one of the largest urban ashwaiiyat, or ‘informal communities’, encircling the city. With more than one million inhabitants, it is among the few places where the poorest of Egypt's poor can afford some sort of housing. However, with high-voltage cables constantly humming over their heads, sewage water seeping under their feet, and the fumes of burning garbage filling their lungs, residents of District 3 are constantly reminded of the hazards they face day in and day out. Cairo’s population has nearly doubled in the last 30 years, from 6.4 million people in 1975 to 11.1 million people in 2005. Ezbet El Haggana, like many of Cairo’s ashawiiyat, was first populated in the 1960s, but did not experience a dramatic population increase until the late 1980s and early 1990s – following a concomitant upsurge in Cairo’s population and the establishment of a bus station nearby. “In addition to all sorts of diseases, we always have fires in these houses because of the high-voltage cables," says Hazem Hassan, of the Al-Shehab Institution for Comprehensive Development, a grassroots organization that has been assisting the residents of Ezbet El Haggana since 2001. Al-Shehab’s latest project is to construct new roofs for 50 of the most threatened dwellings in the district, including that of Ms. El Sayed. The custom-made covers are thick enough to insulate inhabitants from the humming noise and keep out the rain, but are so light that weak walls won’t crumble under their weight. "There are around 3,000-4,000 houses in the Ezbet with no roofs at all," says Mr. Hassan. "Ms. El-Sayed's house was included in the first 50 to be fitted with roofs because she fits our other criteria: she is sick, living alone, and has no one to support her. She was also among the first to be provided with in-house plumbing. We want hers to be a model house." Al-Shehab has uncovered some other equally troubling trends, including widespread malnutrition among the Ezbet’s children. Many live with fathers and stepfathers who routinely beat them, and most are sent out to work at an early age. The lack of adequate infrastructure, including sewage and electricity, also adds to the suffering. More than 80 per cent of households do not have running water. This has resulted in chronic back and spinal problems—particularly among women and girls who are traditionally expected to carry water from water sources back to the household. Adding to the difficulties is a relatively recent development: Racial tension that has flared up following the influx of some 4,500 Sudanese refugee families into the slum over the last decade. “This was an attractive location. It was the cheapest place to find housing, and that’s why we have so many refugees around here,” says Sahar Othman, President of the Local Council of the East Nasr City, an adjacent modern district that has jurisdiction over Ezbet El Haggana. “However, they have their own traditions, and they do not respect those of the local community.” It didn’t help that locals also blamed the newcomers – rightly or not – for a sudden increase in the prices of basic foodstuffs, mainly sugar and oil. This made them the targets of further discrimination. Ms. Othman points out that of the Ezbet’s one million or more residents, “Only 1,200 people carry voting cards, so their voices are rarely heard by policymakers.” In addition, most residents, particularly women, do not have any legal documents, such as birth certificates or identity cards. Al-Shehab, with support from international aid agencies, including UNFPA, the United Nations Population Fund, is up to the task. 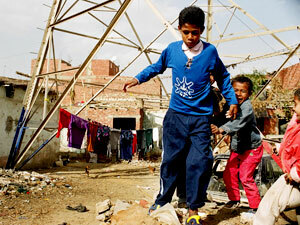 Among its programmes are joint summer camps that include both Egyptian and refugee children. The aim is to help foster understanding, and thereby reduce discrimination. Al-Shehab has also obtained identity cards for hundreds of women and is providing basic services that include: raising awareness of sexually transmitted infections, addressing the perils of child labour, and encouraging women to join literacy classes by providing them with micro-credit as an incentive. All this explains the friendly smiles that greet Mr. Hassan and his colleagues whenever they drop by District 3. The retired security guard collects a steady income from his monthly pension of 300 EP ($60) and serves the community by helping Al-Shehab identify the neediest families in his neighbourhood. "All of us, Christians and Moslems, are in the same boat around here," he says. "We have to help each other." The latest statistics of the Egyptian Ministry of Housing, Utilities and Urban Communities show that there are 1221 ‘informal areas’, similar to Ezbet El Haggana, that house between 12-15 million of the country’s 74 million people. 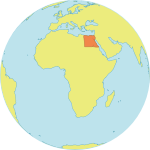 Sixty-seven of these are located in Greater Cairo. The lack of a single definition of the term ‘slum’ means that the Government designates only 20 or 21 of these areas as such, according to Ola Omar Abbas, Vice Chairman of the Ministry’s General Organization for Physical Planning. Mr. Madbouly maintains that it is mostly single people from rural areas who are coming to the new cities. Once they begin earning an income, they invite their families to come and live with them. In addition, the Government is providing the ashwaiiyhat residents with a variety of subsidies, soft loans and some grants to move into these cities. Despite her predicament, Ms. El Sayed maintains a positive attitude: perhaps because she realizes that she is more fortunate than many of her neighbors in District 3—and that a new roof is on its way.